I was browsing Open Sky one day and came across this brand, Healthy Cravings. Healthy Cravings can also be found on Etsy, although that shop doesn't seem to be as stocked as the Open Sky shop for now. If you are unfamiliar with Open Sky, or if you haven't looked at it for a while, it's become a fun place to go to shop for products from small, independent companies. At one time it was a celebrity-based flash sale site, and there is still some of that on there, but there are also lots of fun goodies from small makers like this one. There is everything from food, jewelry, beauty products, home stuff, stuff for men and kids- you can browse forever on Open Sky. There's also a social element to Open Sky: You get points for inviting people [here is my referral link to get a $10 discount on your first order! ], for "liking" products, and for connecting with makers, and eventually the points add up to discounts on products. Open Sky calls them "credits," but these credits can't be used for more than a certain percentage of the purchase price of a product, so I call it a discount. 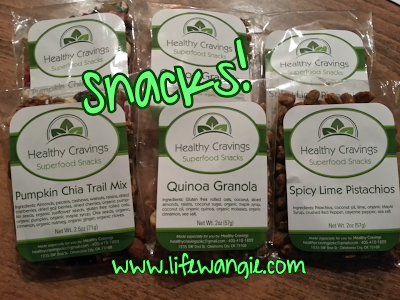 Healthy Cravings generously sent two packages each of the three snacks below to review. Perfect- one of each for me, and one for the hubby. I tossed mine in my bag to bring to work and he has been munching on his throughout the week at home. Hubby and I both really liked all three products. All of them have really fresh and tasty ingredients. 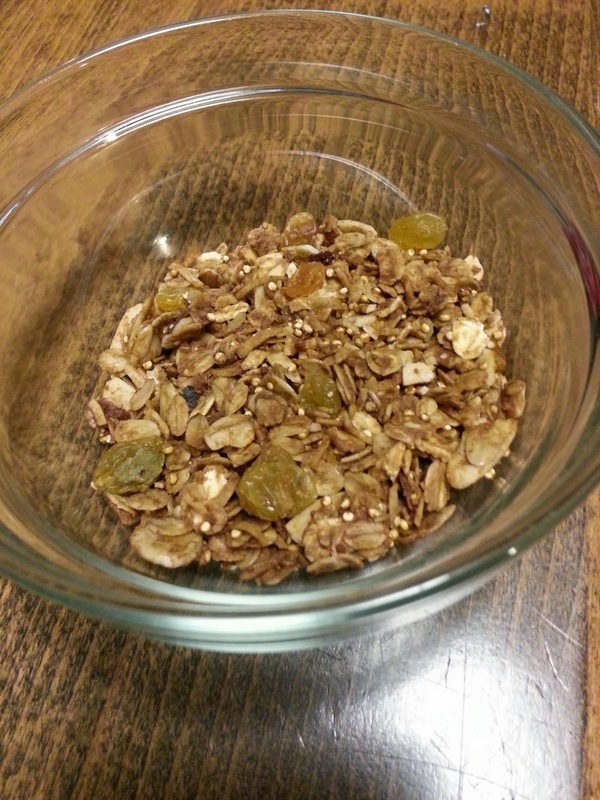 Hubby noted that the trail mix he is used to eating usually is kind of crunchy and hard, whereas the Pumpkin Chia Trail Mix has tons of flavor and the dried fruit bits were plump and soft. It's also really pretty! He thought the granola was a bit on the sweet side, but I thought it was perfect. I actually grabbed this and ate the whole package for breakfast one morning without any milk or yogurt or anything because I was in a huge hurry. This kind of thing would be great to have around in those circumstances. As for the nuts, they are very spicy. I can only eat a few at a time, although I do like them. Hubby loved them and says, AND I QUOTE, the nuts "spanked me and I came back for more." :) I was thinking these nuts would be a good shortcut for some faux-Thai cooking some night too. You know those nights you come home and you just ...can't? Those are the nights I boil some pasta and throw whatever is around on top. These nuts would be great for that along with some veggies and a couple squirts of fish sauce and soy sauce. Overall, these snacks are really over and above anything similar we have ever bought in the store. They are on the pricey side, which is the only downside, although the Open Sky credits/discounts would help. We happen to live in Seattle where there are endless varieties of pricey, natural organic etc etc snacks on the market and these Healthy Cravings snacks are still pretty much better than anything else we have had. Let's face it, those of us who work in offices eat a lot of overpriced convenience food with little nutritional value. I have loved having these Healthy Cravings in my desk to grab instead of going to get some junk out of the vending machine or something. 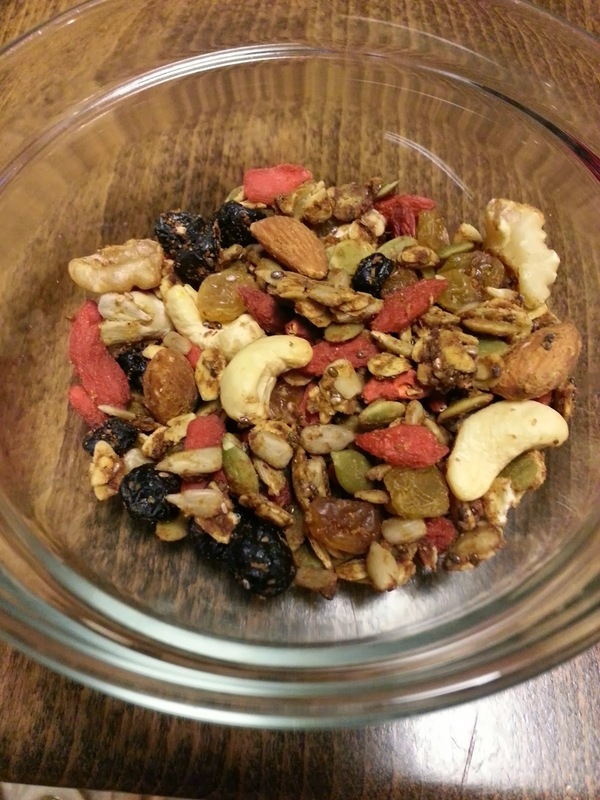 The trail mix looks yummy!